The Bacon-Wrapped Blue Cheese Dates are great with sophisticated, romantic Oscar-winning fare. But when you're watching a nail-biting, heart-pounding thriller you want something you can smash between your teeth. You want popcorn. And this homemade Cracker Jack is just the ticket. Cracker Jack is the snack brand of caramel popcorn with peanuts. It's sold with a small toy surprise as well. This homemade version comes together quickly and is a fun alternative to plain popcorn. Pair this snack with the Nebraska, Gravity, American Hustle and Captain Phillips cocktails. 2. Coat a large mixing bowl with butter and put the popped popcorn in the bowl. 3. Combine 6 tbsp. butter, brown sugar, corn syrup, water and salt in a medium saucepan over medium-high heat. Bring to a simmer, whisking ingredients to combine and cook until the mixture reaches 250 degrees F, about 3 to 5 minutes. Turn off the heat and whisk in the vanilla and baking soda. Immediately pour the mixture over the popcorn and carefully fold the caramel into the popcorn using a spatula then gently stir in the peanuts. 4. Transfer the coated popcorn/peanut mixture to a lined, rimmed baking sheet. Bake for 1 hour, stirring every 20 minutes. Remove baking sheet from oven and set on a wire rack to cool. 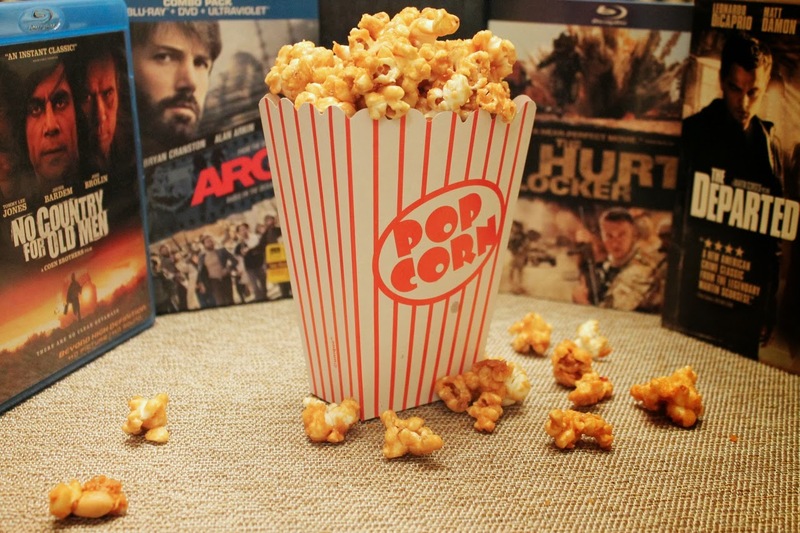 Gently break up the popcorn and serve immediately or store in an air-tight container for up to 5 days. This also makes a good snack when watching "epic family dramas" on basic cable, fyi.